There’s the beating of drums, then, through the freezing February drizzle, a procession of people appears, led by a man in a top hat. They’re singing a sea shanty. You can make out the words ‘Deptford’, ‘London mayor’ and ‘anchor’. They wind through the Saturday market to their destination: a huge old ship’s anchor, tipped on its side, at the junction of Deptford Broadway and Deptford High Street. Five years ago, it was mysteriously removed. Now it’s back. Back after campaigns, petitions and endless appeals to Lewisham Council. The procession is to welcome it home, like a party for someone who’s just been released from prison. Rum is splashed on the anchor. One bloke kisses it. You could be forgiven for wondering what the hell is going on. Forty years ago, in 1978, Time Out’s cover proclaimed ‘Deptford is burning’. The magazine looked at the area’s bubbling art and music scene, but also its desperate neglect: a post-industrial landscape of giant scrapyards and council estates considered too unsafe to house families. A centre of shipbuilding and trade since Henry VIII’s time, Deptford suffered badly when London’s docks closed. Unlike nearby Greenwich, celebrating maritime heritage was way down SE8’s agenda. Then, in 1988, Chatham Dockyard gave Deptford an anchor: a nod from one naval town to another. For 25 years it was SE8’s most visible landmark: how you gave people directions (‘get off the bus when you see the anchor’). It had a ragged tree lashed to it every Christmas, got covered in wool by artists, tagged by kids and for a while bore the legend ‘I luv u anker’, spelled out in stickers. One day in April 2013, to the surprise of locals, a JCB hoicked the anchor off its antisocial plinth and it was taken away. In the words of the 2017 report: ‘The… project resulted in the redesign of the junction with the anchor being designed out and [a] new public realm created in its place.’ (This is also revealing of the way somewhere like Deptford High Street is described in twenty-first-century London: the pavement outside a Londis is now a ‘realm’.) ‘It wasn’t clear that it wasn’t coming back,’ says Collins. ‘In the early days, I was quite happy for it to come back to another space.’ But it didn’t come back. The anchor had disappeared. So what? you might say. It’s sad, but compared to other stuff going on in London, it’s nothing. It’s not Georgian houses pulled down on Dalston Lane, the redevelopment of historic Norton Folgate, or The Carlton Tavern in Kilburn, demolished despite a refused planning application. There’s no faceless foreign developer, just a local council trying to prettify the street and move the boozers on. Actually, though, that was a big part of the problem. If somewhere has an anchor (of all things) as its community focal point and the council takes it away and hides it, while appearing to blame the most vulnerable members of that community, people are going to be pissed-off. ‘The problem wasn’t caused by the thing they thought it was,’ says Collins. 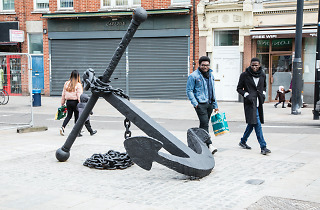 A campaign to restore the anchor saw a petition get more than 4,000 signatures; a Post-it note in the campaign grimly observed: ‘Anchors don’t make people drink on the street – capitalism does’. As Deptford got a new wave of bars, restaurants and not-very-affordable-at-all flats, its missing anchor readily stood for what the area was losing: a sense of its own identity. It was adrift. A photo from Open House 2013 shows the anchor sitting sadly in a warehouse at nearby Convoys Wharf, a proposed billion-pound Thamesside development, which generously claims to be ‘re-establishing a sense of place and identity unique to this part of London’. Boris Johnson (the ‘mayor’ referred to in the sea shanty) had stepped in to push Convoys’ planning through. It was like ‘The Thick of It’. 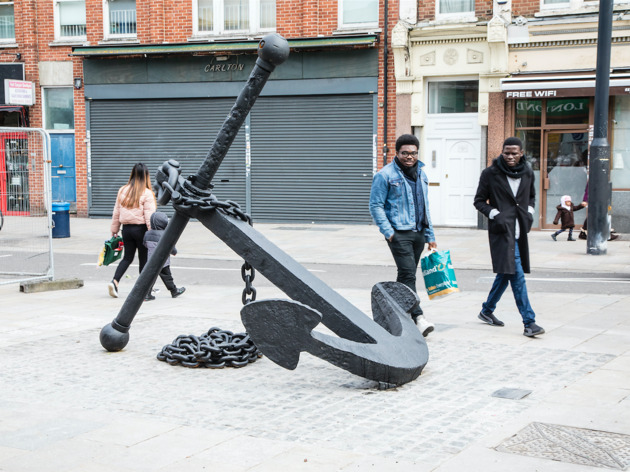 Without being too wanky (or wanchory), the Deptford anchor stands for the personal associations that people have with where they live. Things that councils and developers often don’t see. Things that are important to us as individuals and as Londoners. If London loses its Deptford anchors, its Catford Cats (a giant ’70s fibreglass mog rumoured to be under threat, now safe) and its Carlton Taverns (ordered to be rebuilt) where will we be? I’ll tell you: all at sea. A free exhibition about the campaign is at Deptford Does Art until Feb 28. Learn more.